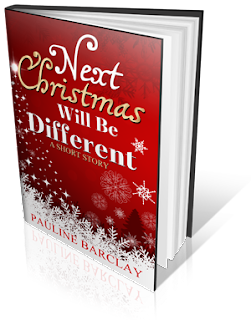 My awesome author pal, Pauline Barclay, author of four top selling novels has released a short festive story in time for Christmas, Next Christmas Will Be Different, and it's now free! "I wanted this short story to be available as a free download to say thank you to all the fabby readers who have read my books. It's a little gift from me to you!" Next Christmas Will Be Different. This short story includes a bonus of five chapters from each of the four published books by Pauline Barclay. An absolutely charming short story which will remind you of the true meaning of Christmas - the importance of being with those that love you. Although just a short read, I absolutely loved this tale. It made me feel all warm and tingly inside, remembering what Christmas can really be like when you spend it in the company of your loved ones. A touching tale by Pauline Barclay. Highly recommended!